Scientists examining Hubble Telescope images of the Moon recently noticed what looked like titanium deposits all around the 1972 Apollo 17 landing site. When they inspected samples of moon rock from the site that were brought back to Earth by the Apollo team, scientists discovered that they were, in fact, chock full of titanium — titanium that could be a vital resource for future human inhabitants of the Moon. Intrigued by their discovery, the researchers decided to pan out from the Apollo landing site and look for titanium across larger portions of the Moon's surface. All it took was a some new photo equipment and a little creative image editing. By manipulating composite images captured by the Lunar Reconnaissance Orbiter's Wide Angle Camera (taken at a variety of visible and ultraviolet wavelengths), researchers Mark Robinson and Brett Denevi were able to reveal that the moon is loaded with deposits of titanium ore.
"Looking up at the Moon, its surface appears painted with shades of grey – at least to the human eye. But with the right instruments, the Moon can appear colorful," said Robinson. "Although subtle, these color variations tell us important things about the chemistry and evolution of the lunar surface. They indicate the titanium and iron abundance, as well as the maturity of a lunar soil." 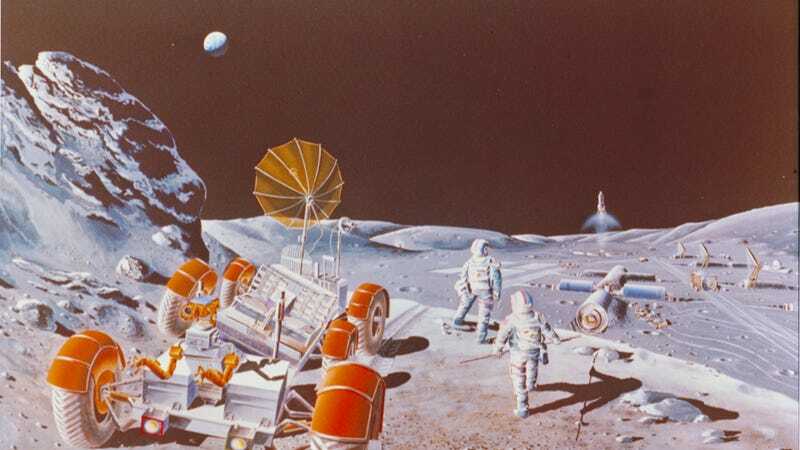 According to Robinson and Denevi, the Moon's titanium-rich minerals are efficient at retaining particles ejected from the Sun via solar wind, such as helium and hydrogen. The scientists say these gases could provide a a source of fuel for future human inhabitants of lunar colonies. The new map is a valuable tool for lunar exploration planning. Astronauts will want to visit places with both high scientific value and a high potential for resources that can be used to support exploration activities. Areas with high titanium provide both – a pathway to understanding the interior of the Moon and potential mining resources.